Welcome back to Mossy Creek! The third novel in the acclaimed Mossy Creek Hometown Series continues the warm, witty, and wise doings in a small southern village you'll want to call home. 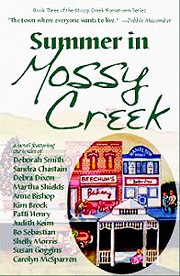 "The Mossy Creek Hometown Series has struck a resonant chord." "In the best tradition of women's fiction, Mossy Creek points to a genuine spirit of love and community that is our best hope for the future." "MOSSY CREEK is as much fun as a cousin reunion; like sipping ice cold lemonade on a hot summer's afternoon. Hire me a moving van, it's the kind of town where everyone wishes they could live."